Here we are, finally it's arrived! New Girmi 100-year catalogue is finally available, full of exciting products for your kitchen and for your house. Since 1919 our great passion has guided us in creating high quality appliances of timeless design, respecting tradition but with a view to the future: because time goes by but our products are made to last. Girmi represents unique quality appliances for cooking with love. Browse the 2019 Catalogue to discover all the great news that we have reserved for you. 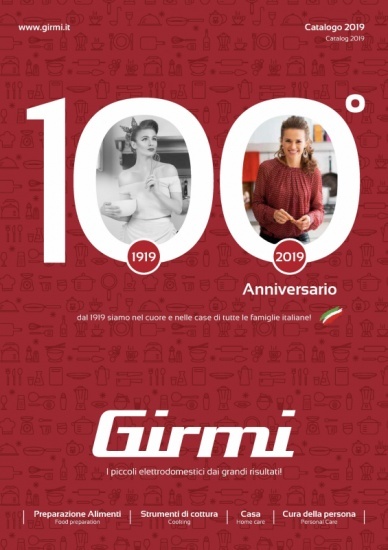 Girmi, in the hearts and homes of the Italians since 1919. Download "WEB Catalogo 6 - GIRMI OTT 2018 low 1"